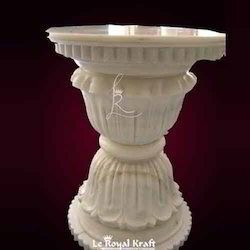 Offering a beautiful design which is made on marble base with decorative and exclusive semiprecious stone with completely handwork by our best artisans. We also offer a wide range Table Base Table Tops, which is available in the market at the most competitive rates. These table base table tops are fabricated using premium quality raw material, sourced from our reliable vendors. Further, our experts test these products on various parameters of quality in order to ensure their durability and reliability. Usage : Lapis Lazuli flooring tile, Lapis lazuli wall tiles , Lapis Lazuli table top , Lapis Lazuli vanity top, Lapis Lazuli slabs, Lapis Lazuli coffee table, Lapis Lazuli decorative wall panel, Lapis Lazuli soild tiles, Lapis Lazuli bar counter. Size : 16" ht x 12" x 12"
The white marble table base combined with the drawing of blue color depicts great amazing and intricate details. These marble table bases are carved from a makrana white marble with inlay lapis work to highlight a look of sophistication. Buzzsaw IPA: Our flagship IPA is loaded with Simcoe, Mosaic and Citra hops giving it layers of tropical fruit, citrus and resinous pine. We are engaged in manufacturing and exporting a wide range of marble products like marble bases. We are engaged in offering an alluring range of optimum quality Deer Table Base to our clients. 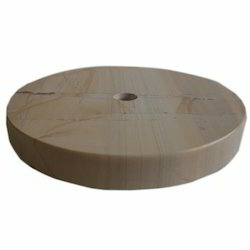 Our table base is highly appreciated for its good quality and durability for a longer period of time. These are highly admired for their quality and designs. These Table Base are available in various designer patterns and designs. We offer black marble bases to our customer. Our company trade Black Marble Bases at cheap rate.